- 0310320771 "Getting Started Guide"
- 0310320763 The Prodigal God Curriculum Kit Box. - Publisher The Prodigal God Curriculum kit contains everything that your church needs to experience a four or six week preaching and small group campaign.In this compelling six-session DVD study, pastor and best selling author Tim Keller presents a new way of looking at this well known parable.Where most teaching focuses just on the younger 'wayward' son, Dr. Keller challenges us to consider both the role of the elder brother and the father as well.Even Jesus began his parable with 'a man had two sons' so, you see, the story is not just about the younger son who leaves home and squanders his inheritance before eventually returning home.The story is as much about the elder brother as the younger, and as much about the father as the sons. To this end, Dr. Keller contends that the story might better be called 'Two Lost Sons. 'In six sessions your group will explore the prodigal who spent until he had nothing left, the self righteous and offended elder son, and the father who forgave with reckless abandon.And in it all, your group will learn the love of the Heavenly Father who lavishes his love upon his children and welcomes us back into his loving arms.Session titles include the following: The ParableThe People Around JesusThe Two Lost SonsThe Elder BrotherThe True Elder BrotherThe Feast of the FatherThe kit contains one (1) each of the following: 0310325358 The Prodigal God DVD, 0310325366 The Prodigal God Discussion Guide, 0310320771 'Getting Started Guide', and 0310320763 The Prodigal God Curriculum Kit Box. 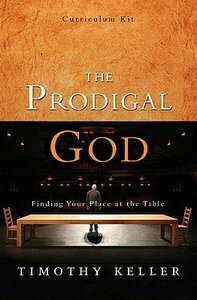 About "The Prodigal God (Curriculum Kit)"
The Prodigal God Curriculum kit contains everything that your church needs to experience a four or six week preaching and small group campaign.In this compelling six-session DVD study, pastor and best selling author Tim Keller presents a new way of looking at this well known parable.Where most teaching focuses just on the younger 'wayward' son, Dr. Keller challenges us to consider both the role of the elder brother and the father as well.Even Jesus began his parable with 'a man had two sons' so, you see, the story is not just about the younger son who leaves home and squanders his inheritance before eventually returning home.The story is as much about the elder brother as the younger, and as much about the father as the sons. To this end, Dr. Keller contends that the story might better be called 'Two Lost Sons. 'In six sessions your group will explore the prodigal who spent until he had nothing left, the self righteous and offended elder son, and the father who forgave with reckless abandon.And in it all, your group will learn the love of the Heavenly Father who lavishes his love upon his children and welcomes us back into his loving arms.Session titles include the following: The ParableThe People Around JesusThe Two Lost SonsThe Elder BrotherThe True Elder BrotherThe Feast of the FatherThe kit contains one (1) each of the following: 0310325358 The Prodigal God DVD, 0310325366 The Prodigal God Discussion Guide, 0310320771 'Getting Started Guide', and 0310320763 The Prodigal God Curriculum Kit Box.